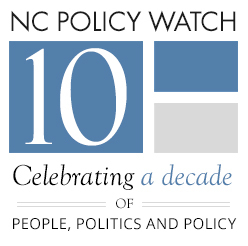 Holiday Season and the hubbub that comes with it are almost upon us so don’t wait too long to get your tickets for the upcoming NC Policy Watch 10th anniversary celebration. Please join our three co-hosts – former Governor Jim Hunt, Senate Minority Leader Dan Blue and Capitol Broadcasting CEO Jim Goodmon – Monday, December 8, 5:30 – 7:30 p.m., at The Stockroom in downtown Raleigh. It should be a festive and energizing evening. Click here for more information. Hope to see you on the 8th!